A belated happy valentine's day to everyone who tagged/greeted/posted testimonials on Friendster! I was really busy yesterday and I didn't get the chance to greet anyone (or check my accounts on the Internet). Valentine's Day was... fun! I got some stuff. 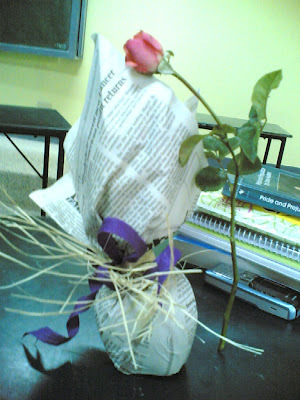 So I got a beautiful fragrant rose from Arn2x, and a red apple (which I ate with peanut butter for dinner) from Suy2x. It was cool of them to give out stuff. I periodically thought of giving people flowers then gave up on the idea. 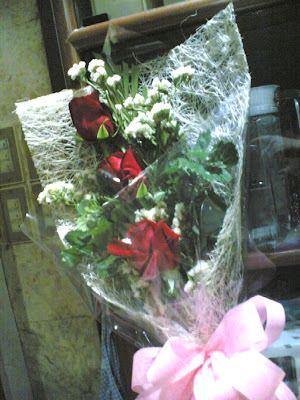 My Dad also got my Mom a bouquet of red roses. My mom's friends are a little jealous about how my Dad always remembers to do something special for her without anyone reminding him. It is pretty sweet of them. It was cool to remember God's love is perfect. I mean, even if I will probably get a boyfriend one day, he's not going to be great all the time. And I guess that's where God comes in. I don't know if that made much sense. The way I think is if you love God first, you'll be able to love other people (friends, family, and that future imaginary boyfriend) more than you would on your own. And that was Valentine's. Moving on, something funny happened last Tuesday. Some friends and I were sitting in my car and listening to music in school. Then a herd of sheep come running into the soccer field beside my car, and start eating the grass like there's no tomorrow. We all just stared. 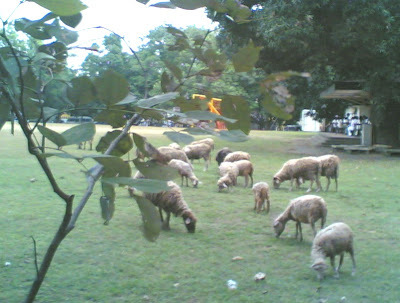 I mean, we didn't even know there were sheep in our school. Or maybe I didn't know. It was pretty weird though, an experience similar to driving beside a man riding a horse on the road or letting a cow cross the street (both of which have happened to me).